The topic of race is at the forefront of the public eye right now. For me, it is nearly always on my mind and I am constantly considering its both subtle and endemic impacts, however I would say that makes me a very, very strange case among white folks. 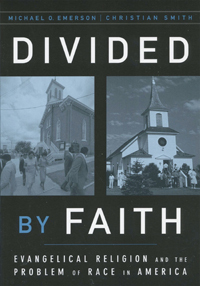 I've talked about race some in this space and over the next few posts I’d like to endeavor a much more wide-ranging discussion by taking us through a summary of a book: Divided By Faith. However, I will intentionally seek to write in such a way that each post can stand on its own, so you need not to have read the preceding posts nor the book from which they will be largely drawn. Originally published by Oxford University Press in 2000 the book is a highly acclaimed academic work subtitled, “Evangelical Religion and the Problem of Race in America.” The authors Michael Emerson (not Ben from LOST) and Christian Smith are both sociologists and both committed Christ-followers, of whom I am confident in both their academic integrity and actual understanding of Christianity (and American Christianity in particular). Also, the book largely focuses on race in America in terms of African Americans and whites. This is not because the authors or I want to discount other groups, but is based in historical depth between these two groups especially with regards to religion. So, note that as you read. So, as we look to dive in I hope you’ll join me on the journey. The next post will be up Monday. Does race matter in America in 2013? Do Christians have any particular call to discuss or care about these issues?